I know that I may be in the minority here, but for some odd reason I have always liked beets. Even as a kid when I probably should have known better. But there it is, I guess we all have our odd tastes. What I have never liked, however, is preparing them. They seem to take ages to cook and then they dye my hands and everything else they touch so that the whole kitchen looks like a murder scene. Since moving to Germany I have occasionally eyed the readily available pre-cooked beets at my local market, but had not until now tried them. For some reason they always looked a bit suspicious to me, but heck, if Dorie and Julia endorse them, who the heck am I to quibble! 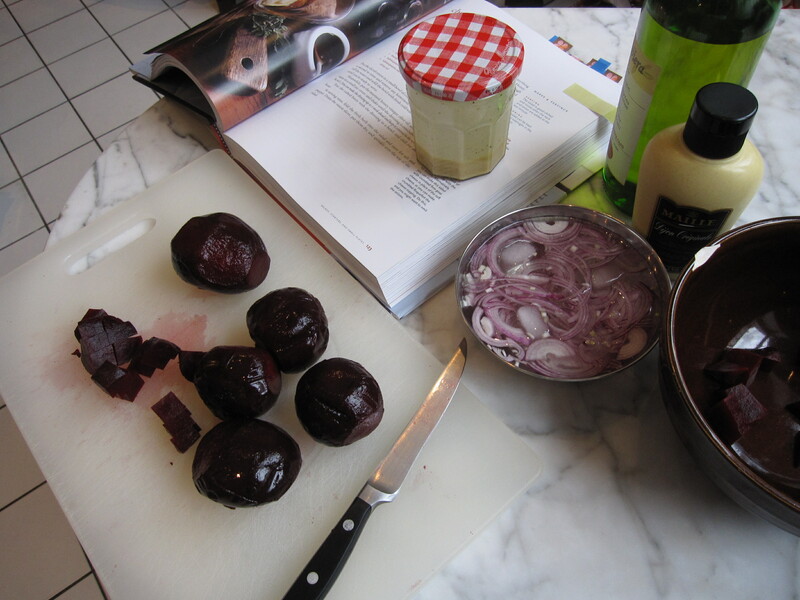 So, pre-cooked beets in hand, Dorie’s Chunky Beets & Icy Red Onions was one of the easiest French Fridays with Dorie recipes yet. It may have actually taken me longer to take the pictures than it did to actually put the salad together. This may be because I discovered that it is a bit tricky to photograph beets because they come out looking black instead of red, or at least mine did, but I digress. This is exactly the kind of food I love, substantial salads which can, as occasion demands, play either a supporting role or, with a little bit of sprucing up, the meal lead. All that and tasty too! This entry was posted in french fridays with dorie and tagged Around my French Table, salad, vegetarian. Bookmark the permalink. Pre-cooked beets would definitely take all of what little work there was out of this dish. Looks good! I wish I had access to some pre-cooked beets! The most annoying thing about this recipe was having to heat up my kitchen for an hour so I could roast the veggies. Next time I might try the microwave method! Exactly! Not so much fun to turn on the oven in the summer. I had beets for the first time three weeks ago and loved them. I can’t believe it took me that long to try them, but like many people, I thought I didn’t like beets or didn’t think the stuff from a can was worth my time. They definitely seem to have a bad reputation, maybe it’s because of the canned stuff, but for some reason I have always liked them. Yes, pre-cooked beets are the way to go especially for an easy salad. I’d never tried the pre-cooked variety until this salad which is so quick and easy that not having to cook makes this recipe all the more fun….then there is time to bake something really good! I love beetroot too! I think it’s a really Aussie summer thing, but we only ever use the canned stuff. And it’s great! We all loved this salad and will definitely make it again! I think your photos turned out great! Love beets but passed this week! Your salad looks wonderful! Looking forward to trying it! Your photos look great! Have a nice week-end! I wish we had pre-cooked beets for sale here! But Canada and the US seem to be beet-phobic, so perhaps that’s why. 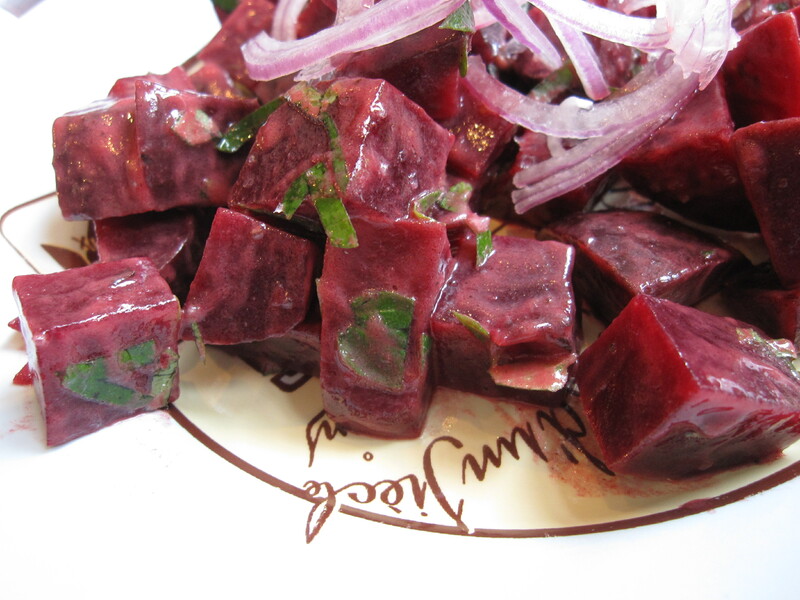 I love beets – glad you enjoyed the salad! I envy you your precooked beets! We enjoyed the salad; glad you did too. The precooked beets here do not come from cans. They are in the refrigerator section of the grocery store, or many of the produce markets also sell them already cooked. I admit that I have never eaten canned beets before, but sounds like they are not too tasty. I used to only use canned beets mixed with a vinaigrette (that story is in my post), but there’s no substituting the taste that comes from roasting or steaming fresh ones. I chose to steam this time because of the warmer weather, but roasting is my favorite method. I LOVE beets!! Happy to hear that you like the recipe. I have never tried canned beets before, but by the sounds of it, I am not missing much.